You may have read my recent post on The Caker, aka Jordan Rondel. She makes unusual but mouthwatering cakes, cookies and sweet delights. This recipe is from her first book, as pictured below. These cocoa coconut treats are super simple to recreate, and are perfect as a lunchbox snack, a ‘pick me up’ at work or enjoyed with a hot cup of tea. Jordan says in her book that because the treats are vegan, they can also be served raw – just chill the balls in the fridge for an hour or so. However, baking them in the oven gives them a texture, somewhere between a truffle and a cookie, crisp on the outside and soft in the middle. Sounds perfect! 1. In a bowl of an electric mixer, combine the coconut, cocoa powder and rolled oats. Mix in the maple syrup, coconut oil, vanilla and cinnamon. Mix to combine well until a dough forms. 2. Wrap the dough in plastic wrap and chill for 20 minutes. 3. Preheat the oven to 100 C fan-bake. Line a tray with baking paper. 4. Using your hands, roll the mixture into 3cm balls and set them on the baking paper. (They won’t spread, so ample space between them is not important). 5. Bake the treats for 20 minutes. 6. Allow to cool for 10 minutes. 7. 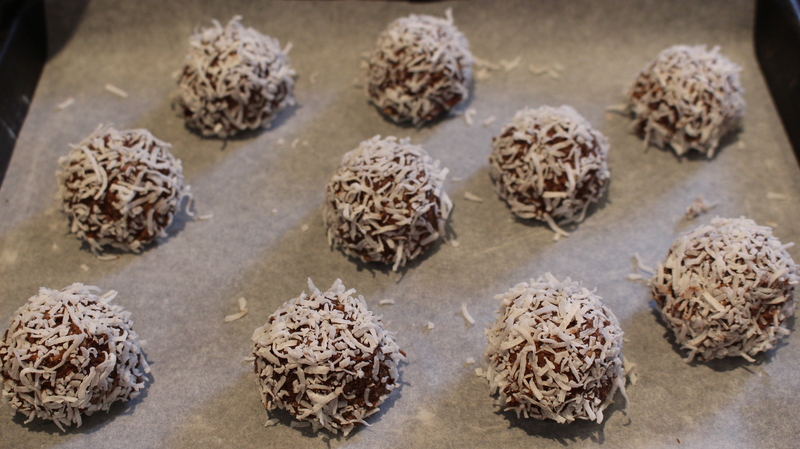 Roll the balls in the extra shredded coconut. Store in a cool, dry place in an airtight container for up to a week.